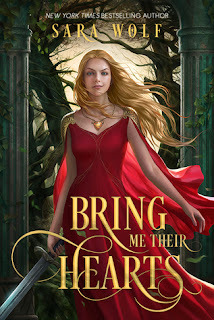 It's been a while since I've read a 5 star (out of 5 stars) book, so Bring Me Their Hearts was a welcome delight. I stayed up past my bedtime at the end because I had to see how it would all shake down. Let me do you this public service and inform you that this is the first book in trilogy. You're welcome! So hopefully when you read it you won't be freaking out about the ending as much as I was at the time. Zera's personality ... it was a little much at times. It's nice to see a character with some snark and sass about her, and especially one in a situation like hers where she pretty much has no choice about what she must do. But at times it went a bit overboard and she grated on my nerves. The flip side of this was that I loved the banter between her and Lucien. The two of them really are such a great pair, and actually similar in a lot of ways. I also really enjoyed getting to know the supporting characters around Zera and appreciate them as she comes to. Except the villain. It was very easy to hate him. The author's note I received describes the story by saying, "It's a story of defying that dark inner voice inside all of us -- the one that tell us that we're not good enough, that we can't do the right thing -- and moving forward with our lives." Bring Me Their Hearts does really well in so many areas: World-building. Character arcs. Pacing. It publishes Tuesday, June 5th and you should definitely grab it if you can. Thank you to Entangled Teen for sending me an advance reader's copy in exchange for my honest review.